I wanted it to be an extra little room with lots of plants, a mix of faux and real as I am hopeless at taking care of them but I do love the smell so mix and match was the perfect compromise, a table so I could work outside on both of the days the sun shines in England, candles of course, and a hanging chair to give it that awesome boho feel and a perfect place for the dog to take a nap it seems! 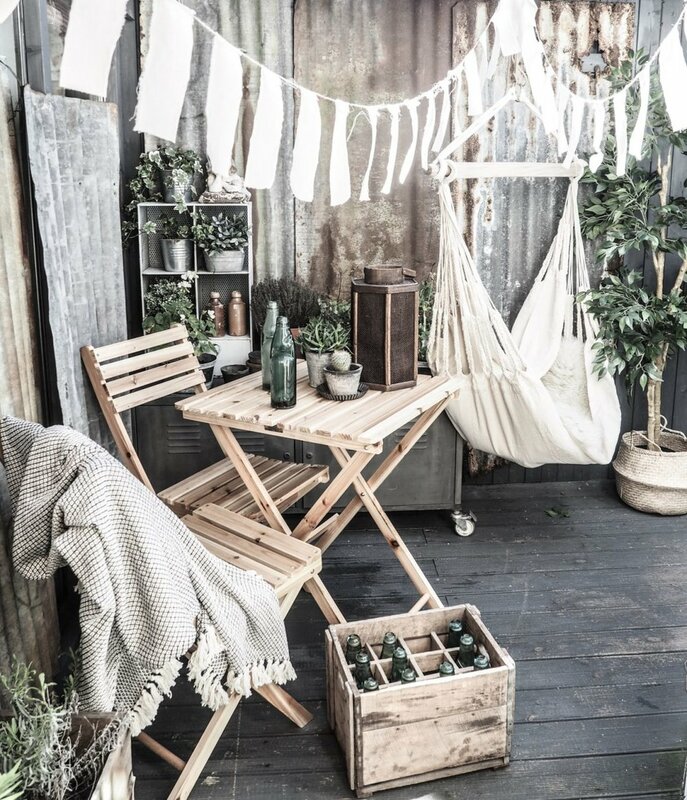 I adore reclaimed materials so I got a few corrugated tin roof panels and covered the fences, add to that throws, sheepskins and bunting and boom we go from boring to boho heaven in no time at all! So thank you Wayfair for coming up trumps with the amazing choice of outdoor furniture and accessories. The table is the perfect size to hold a laptop and a cup of coffee or bottle of beer depending on mood, the hanging chair is dreamy and the whole space really does feel like an extension of the house. Just this once size really doesn't matter! Disclaimer: Sample product were gifted to me and financial compensation may have been received but all opinions expressed here are my own. Products and services provided free of charge to Kate Young Design are only mentioned in a post if they are a natural fit with my content.